Inmotion Hosting is not a household name when it comes to website hosting, yet this US-based company has managed to wriggle its way up to the top of our web hosting buying guide ahead of bigger and better known competitors (Godaddy, 1&1 and Hostgator to name a few). 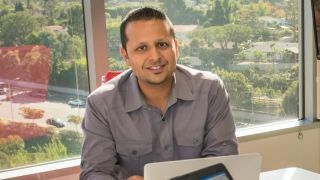 We sat down with the company's CEO, Sunil Saxena, to find out more about the company's ethos, what drives them and what he considers to be the biggest challenges and opportunities that are currently on top of the agenda for players in the web hosting market. Check out our list of the best website hosting companies in the world. 1. Let's start with the basics. Tell us a bit more about InMotion Hosting. InMotion Hosting is an independent, employee-owned and operated hosting provider based out of Los Angeles, CA - with additional offices in Virginia Beach, VA and Denver, CO. With over 17 years of experience, InMotion Hosting has a proven track record of stellar customer service and an elite array of hosting products. InMotion is CNET certified, possesses an A+ rating with the BBB, and has received numerous industry awards. As one of the few remaining independent hosting providers in the industry, InMotion’s focus on customers and their journey is the number one priority. InMotion Hosting also provides professional web hosting services for individuals and businesses through a wide portfolio of hosting products. 2. In your opinion, what differentiates InMotion Hosting from other web hosts in the market? What sets InMotion apart as an independent web hosting provider is our customer-centric, community focused approach to providing hosting solutions. We are deeply embedded in many of the online communities that shape the way consumers strive to build out their web presence and, in having such a unique bond with our target market, we develop products in line with our end users’ needs. Further, our culture of continuous improvement and revenue re-investment in staff training, education, and hardware allows us to best serve customers that come to us with a wide range of hosting needs. 3. What does your day-to-day work look like? As an employee-owned and operated hosting provider, we have a wide range of talent that spans across many departments from front-line Technical Support & Customer Service to Server Engineering & Infrastructure Monitoring. Each day is different but always has the same goal in mind -- to continuously improve our tools, ourselves, and our customers’ experience. 4. What does the future of Web Hosting look like? How will things change in a near future? We continue to see industry consolidation with large corporations purchasing web hosting companies and consolidating operations. We also see deeper partner integrations with complementary services continuing to rise. Companies see vertical integration as a way of simplifying the consumer website space and we see significant value in streamlining this process. 5. Where do you see InMotion Hosting in 5 years? As a provider of niche products and services to our needs-driven customer, while providing the market with mass-customized and top of the line hosting solutions, we plan to focus a wider international presence for various emerging markets with a need for an augmented online presence. Further, we feel it is imperative to continue innovating. Even though technology needs will change over the next decade, we do know that we will be ready to offer our high quality products and services to the hosting customers of the future. 6. What are the most pressing challenges in your line of business? In an industry that has high levels of commoditization, it is important to differentiate ourselves by offering state-of-the-art products supported by extraordinary staff. We believe that part of our “secret sauce” is our staff and the deep knowledge we have of the hosting industry. The sharing of this knowledge is also of paramount importance and that’s why we have made over 4,000 knowledge-based articles available to the public for free. 7. What do you think are the biggest opportunities in your line of business? With the advent of “single serving” website building solutions, the consumer has become aware of the shortcomings these companies offer. We want to offer a seamless approach to solving the website question. Everything from picking a domain name to running your web analytics - this is one opportunity we’re all very excited about. 8. How do you view Facebook pages and Google My Business? As a wonderful opportunity to introduce consumers to website building. We envision these services exciting consumers on the topic of building out their very own web-presence. As this fascination continues to grow, we will naturally see early adopters looking for a more robust solution and this is where companies such as InMotion Hosting will be able to satiate this more sophisticated customer. 9. What are the ways web hosting businesses can differentiate themselves from the competition? Good question. Great question, actually. Without sharing our “secret sauce”, for us, it all comes down to a great experience built on the pinnacle of web hosting infrastructure. 10. How easy is it to innovate in the web hosting business? Innovation is the life-blood of any tech company. In order to maintain an innovative advantage over the competition, we need to remain very close to our customers and have a solid understanding of macro issues which may affect the industry. As with any other tech provider, staying at the forefront of technology is imperative. We employ and partner with thought leaders in the industry and follow trends very closely. We were one of the first companies to introduce free SSD (solid state drives) as we anticipated market demand. SSL (Secure Sockets Layer) and WordPress-specific product configurations is another great example of forecasting market demand and innovating strategy to meet future demand.